Following our debut exhibition at the Scottish National Portrait Gallery in 2006 four pieces from the Fizzers® collection where acquired by the National Galleries of Scotland. After the refurbishment of the SNPG one of the pieces – Brian’s caricature of Wet Wet Wet front man Marti Pellow – was used in one of the new interactive digital installations at the gallery. In two weeks’ time a major new exhibition portraying Scottish comedians opens at the SNPG and Derek’s caricature of Chic Murray has been selected for inclusion. You can find out more about Tickling Jock, which will run well into next year, at the National Galleries’ website. We’ll report on the remaining two pieces as the Galleries’ plans are revealed. 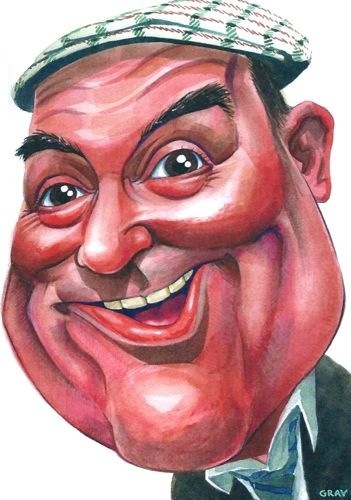 There are over 400 famous faces in our caricature collection; if you are an exhibitor, publisher or business interested in using artwork from the archive please get in touch.